Educational articles focused on the benefits and experiences of band trips and music performance tours. 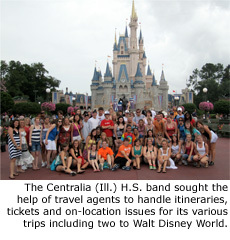 Working with a travel agency for band trips allows directors to focus more on the music and less on the logistics. Planning a trip for a marching band is a huge and complicated task not to be taken lightly. In some cases, working with a travel agency can help ease the load and open up additional opportunities for bands and directors. Band director Kevin Devany from Centralia (Ill.) High School worked with travel agencies on two trips to Walt Disney World and a trip to perform at the Sugar Bowl. Here, he shares his advice. Working with a travel agency is highly recommended in case of longer, farther trips. "It puts everything at ease knowing it's all taken care of," Devany says. "Instead of writing checks to all these different places, you just write one check, and they disperse it out. It's great and it doesn't cost much more at all." Using a travel agency also allows the director to enjoy the trip a little more and focus on the music and people instead of logistics. "It helps you relax and allows you to attend to the kids and families that go instead of tending to tickets and reservations," Devany says. "It's a nice luxury to have." Before committing to a specific travel agency, do your research. Ask around to find out which travel agencies have worked for other groups. "Do your homework, talk to other directors, see their views and what they recommend, and do your own research," Devany says. "Call different agencies and get quotes. They're eager to help you be prepared for your students to have an educational opportunity." Try travel agencies in different locations to see which one has the best price. In Devany's case, the price range didn't vary much from agency to agency, so the deciding factor was reputation and the number of free trips the agency offered for the chaperones (per number of students). "Whether they're local or far away, they can do the same thing," Devany says. "It's just who has the best price for that trip that year and what opportunities do they have available and can help you out with." Some events or performance venues may have already chosen a preferred travel partner. For example, the Sugar Bowl partners with Bowl Games of America (BGA) to bring bands to the event. Centralia's trip to New Orleans was planned by BGA, and included a dinner cruise and a haunted tour of the city, but Devany had to organize the transportation on his own. In addition to the musical experiences, band trips provide opportunities for cultural expansion as well as bonding. Bands are able to tell the travel agencies what types of experience they would like on their trip, and from there the agencies plan out the events and make other suggestions based on the location. In Florida, Devany's band visited Kennedy Space Center and U.S. Astronaut Hall of Fame, and on one night, the band split into small groups and dined at different restaurants such as Rainforest Café and the House of Blues, which the travel agents made reservations for. "You tell them what you wantI have an idea of where I'd like to take the band, and they set it all up for you and get you the information," Devany says. "You get to create your trip with the assistance of people who know what they're doing." Once on the trip, many agencies provide a local guide who can give tours and advice. When Devany wanted to plan a last-minute beach stop, the guide was able to pick out the best beach and get the bus drivers there. "The guides are always great; they help the bus drivers out," Devany says "They're there for your assistance; they're not on or with you the whole time. They keep their space, but when you need something, they're right there. They're a tremendous help and know the best places to go." Travel agencies not only make the trip planning and logistics easier, they provide an extra level of security should anything go wrong on the trip. For example, when a student lost a Disney ticket, the guide was able to help get it replaced quickly, and when kids get sick or sunburned, the guide can direct you to the nearest pharmacy or convenience store. "In case you have any problems, there's someone to take care of you," Devany says. So far, all of Devany's travel agency experiences have been positiveand he recommends that other directors and bands use them when possible. "Granted, I've only taken three trips, and each trip has been extraordinary," Devany says. "With careful planning and communication with your travel agent, it's hard to have a bad experience." About the Sponsor: Disney Performing Arts offers young people the opportunity to challenge themselves to achieve performance excellence at unparalleled venues at the Walt Disney World Resort and Disneyland Resort. Performing groups can experience the Performance of a Lifetime with Disney Performing Arts OnStage, the thrill of competition at Festival Disney, Disney's Jazz Celebration and Disney Step Classic, the pinnacle of musical achievement at The Disney Honors, or the power of practicing with a Disney Entertainment Professional with Disney Performing Arts Workshops. Each unique opportunity offers a once-in-a-lifetime experience of Disney magic and memories. For more information please visit DisneyPerformingArts.com. Photo courtesy of Centralia H.S. Band. Logo courtesy of Disney Performing Arts.